This section is a work in progress and will evolve constantly as we learn more. As I add this the story is told only to the point just before Thomas Bulch emigrates to Australia – but what follows is the beginning of a detailed account of the incredible story of The Wizard and The Typhoon. In the heart of Shildon, opposite its Town Square where stands a tall metal arch commemorating the turn of the last millennium, and an on looking statue of the railway pioneer Timothy Hackworth, there is a wall, some 15 feet tall, set back from the street. Midway up that wall and about two-thirds of its length to the right, there is, embedded among the brown bricks, a stone commemorating a man. Nestled, as it is, between the town’s Library and a retail outlet store, and frequently wallowing in shade, natives of the town, and occasional visitors pass by it without giving it so much as a glance; eyes drawn instead to the glamour of the square opposite with its patterned brick and stonework that frames decorative metalwork against an appealing backdrop of leafy trees. What attention can this humble, unassuming, inscription possibly draw when opposed by such a display. In many ways, the owner of the name carved in this stone was as ordinary, unassuming and overshadowed. A man who stood shoulder to shoulder with his fellows at toil in the workplace, and enjoyed their good company, a drink and a song. But this was also a man who forged a special place among his band of brothers. He was a man who sparked, nurtured and grew a talent that would bring pleasure to not only those who spent time in his company but also those as far distant as the opposite end of the Earth. Even today the echoes of great sounds that originated within his mind, still resonate. That man’s name was George Allan. For one town to have produced one such son, is a deed of which Shildon should be proud. As the world’s Cradle of the Railways; the place from which the first passenger steam locomotive embarked in 1825, and from where the Stockton and Darlington Railway would eventually branch out in all directions; it is fair to say that Shildon has more celebrated causes of civic pride. However, the importance of George Alan’s contribution to brass band music is worthy of some fanfare. What is more remarkable, however, is that it is that Shildon did not produce such a talented child once – but twice. There were two outstanding sons of a railway town that learned their art together. Two determined lads that grew up only a few doors apart from each other, spent their early working life relatively side by side. Boys that competed briefly with each other for honours and became immensely respected as artists among their peers. What’s more, they passed whatever they could of the skills that they had on to others, who in due course passed as much as they could on to others, who passed on whatever they could in a cycle which is still carrying on today. What makes this story so remarkable is that this second son of Shildon, rather than reach out to the world from Shildon as George Allan did, removed himself to that farthest place on Earth and utilised his abilities and acumen in such a way that the sounds of his music extended all the way right back here to County Durham. That second man was Thomas Edward Bulch. Two men, contemporaries, and in many ways pioneers; of differing but comparable talent and resolve; working at opposite ends of the globe, separate, yet bound together by a commonality of birthplace and an array of coincidences. That Thomas Edward Bulch does not, currently, share the prestige of commemoration within Shildon itself should not deceive you into thinking that either of these men should be considered less of a son of this town than the other. Both men were forged of a similar ore in the crucible of opportunities that was 1860s New Shildon. Both were born to families among the many that were drawn here to a new industry that was exciting and terrible, innovative and quite dangerous. Both, to a greater or lesser extent, will share common genes with those still here in Shildon and the wider region. Throughout this narrative you will see many references to New Shildon, for the Shildon we know in its entirety today was, for much of the duration of this story, two very separate places. Whereas Old Shildon stood long and proud up on the crest of the hill, New Shildon only really began to spring up at the beginning of the 19th Century as a community of workers to support the Stockton and Darlington Railway. The two places were separated entirely from each other by green fields. Today, though local residents still make distinct references to the two areas through the Old and New prefixes, the streets of the communities interlace to form a single town. As with the Bulch and Allan families, there are not many New Shildon folk that can trace a lineage specifically within the town beyond the early to mid-1800s. Before the coming of the railways, the area’s population fluctuated between 10 to 20 souls. Yet by the beginning of the 1860s, the decade in which first Thomas Bulch, and then George Allan, were born New Shildon had swelled to a population just short of 1150. Almost all of them were strangers, outsiders, interlopers and opportunists; a new community brought together by a personal need to survive, or a typically Victorian sensibility to strive for personal betterment. Before looking into the extraordinary capabilities and qualities of both George Allan and Thomas Edward Bulch, however, we need to consider the influence of one other man. A man who, with his own sons, would take these two young men under his wing and unlock the skills that would set them on their way. Francis Dinsdale was born on the 28th September 1813 at Buttersett, Hawes in Wensleydale in the Yorkshire Dales. Buttersett was little more than a hamlet that traces its roots to just after the Norman Conquest. Initially established after the Norman conquest of Britain, as a clearing to house a Norman ‘forester’ or gamekeeper, by the early 1800’s Buttersett was a scattering of farmsteads. His parents were Anthony Dinsdale and his wife Margaret (née Sill), of which little beyond the outline of their lives is known. Francis was born before the peak of the lead mining industry in the dales, so, quite probably in search of a living, the young family moved to Thirsk, where Francis was soon joined by a brother, Anthony, on 2 June 1816, and later a further brother James was born in 1819. There is not much detail to be had of Francis’s early life, except that childhood in the early 1800s was brief, and education for the poorer classes was limited. Sunday Schools existed to teach the reading of the bible. Schools of Industry and Monitorial Schools were rare and existed to give elementary instruction on basic skills or prepare pupils for specific industries. General Infants Schools and Elementary Schools were gradually introduced from the 1820s onwards. Whether Francis Dinsdale received any formal education we can only speculate. We do know that at some time before 1835, and probably as a young man looking for employment, Francis moved to Darlington where he married an 18-year-old Mary Burnside from Shincliffe. The young couple had not yet settled, and their first child Elizabeth was born during a brief period where they lived in Stockton-on-Tees. But, by 1837 they were back in Darlington and over the next few years, there were 7 children overall, two of which did not survive infancy. In around 1848, Francis and his family moved to Strand Street, in New Shildon, the town where he would settle for the remainder of his days. The family expanded further and there was more tragedy when one further child, a son named Watson Dinsdale, passed away on the day he was born in 1858. Infant mortality in the Victorian era was commonplace and was caused as much by poor sanitation, dirty water and the pervasiveness of disease as anything else. Growing industrial towns like New Shildon initially struggled to cope with, and provide the rapid basic public amenities infrastructure for, their rapidly swelling populations. A safe and reliable water supply was not introduced to Shildon until the 1860s. By 1851 Francis Dinsdale has secured a post as a Telegrapher. Telegraphy was a means of conveying messages over medium to long distances that had begun with manual visual signalling based systems in the 18th century and gradually developed into electrical telegraphy in the early to mid-1800s. Telegraphy developed as a technology necessary to operate a railway network and for a time was an indispensable tool in conveying the movement of rail traffic and goods enabling avoidance of collisions and line blockages. One particular thing that we do know about Francis Dinsdale is that somewhere through his early years, and journey to New Shildon, he learned the principles of music, and brass music in particular, with sufficient expertise to conduct a band. The Durham Chronicle of 14 Sep 1855 tells of a game of Cricket at Shildon on Monday the 3rd September where Yarm was the visiting cricket club. The article adds that “The West Auckland Brass Band, ably conducted by Mr F Dinsdale, of New Shildon, attended on the occasion, and played several popular airs during the day, which gave zest to the day’s amusement.” This reveals that Francis Dinsdale was involved in the running of brass bands. We don’t know how long Francis had been involved at West Auckland, but West Auckland Brass Band is first reported in the Durham Advertiser of 2 July 1852 so predates that report. The town of West Auckland being no more than 3 to 4 miles from New Shildon it would have been a relatively easy distance for Francis to travel for rehearsal, however, to establish something a little closer to home would have been a tempting prospect. Not long after settling in the town he was to establish himself as a key player in the founding, running and development of the New Shildon Saxhorn Band. Though the earliest ‘Brass Band’ in Britain is believed to date back to around 1809, the specific ‘saxhorn’ range of ‘valved bugle’ instruments, from which the New Shildon Saxhorn Band derived its name, was developed during the 1830s. They were first exhibited in 1844 and then patented, by their creator Adolphe Sax, in 1845. This suggests that a ‘saxhorn band’ anywhere in Britain is unlikely to have emerged before that period. Sax did not invent the ‘keyed bugle’, and never claimed to have done so, but the patented ‘saxhorn’ was instead perceived to be an instrument of a much higher quality than its predecessors. The ‘saxhorns’ were popularised by the distinguished Distin family of performers and instrument manufacturers who toured Victorian Britain and Europe during the mid-19th Century. It was this family that was believed to have had the most significant impact on inspiring the growth of the brass band movement. John Distin and his sons; George, Henry, William and Theodore, all excellent players of ‘keyed bugles’ were treated as celebrities by press and public alike and, as a consequence, there was much interest in their use of Sax’s instruments. New Shildon’s population, prior to the popularisation of the saxhorn, would be so scant as to make a Shildon based brass band unlikely prior to the 1840s; though we do know that there was a Railway Works band of sorts in this decade as the Durham County Advertiser of 8th January 1847 tells us that at the annual “soirée” of the Shildon Mechanic Institute a party of 600 inhabitants of Shildon sat down to dinner in the long room for tea, coffee and Christmas cake and to receive addresses from Timothy Hackworth and other grandees of the railway industry. Throughout this “The Shildon Brass Band was in attendance and played at intervals in a style that reflected credit on them.” A further newspaper report in 1848 noted that one such was supplying music at a similar social function which included influential people such as Timothy Hackworth and Henry Pease. In a new, and rapidly growing, town, the formation a brass band would have been a good means to bring together sections of a community seeking a way to unite following having been pulled from various corners of the region. It would certainly a while to assemble the volunteer members of a band, to raise the funds for instruments, unless a band were to be sponsored by the magnates of local industry, to then tutor the performers in the basic skills of reading the musical notation and the roles, handling, looking after and playing of the respective instruments. To encourage quality, as well as foster community pride and solidarity, band contests began to emerge in the mid to late 1850s. The earliest known reported instance of the New Shildon Saxhorn Band attending a contest, yet not competing, was one that took place in Bishop Auckland on 4th Sept 1857. The Teesdale Mercury, of the time, tells us “The Shildon band were also upon the ground, but being lately formed, they did not compete for the prizes.” We can conclude from this that the band may have been formed sometime either early 1857 or else late 1856. 1856 is significant in that it saw a change to the law of the land that allowed Sunday bands to play in recreation grounds and parks, which were themselves increasing in popularity during the Victorian era. Providing musical entertainment outdoors required a particular type of band with instruments that could project, and be well heard, in such open spaces. Military bands and brass bands were ideal. Another influence on the emerging popularity of the brass band movement was the existence of church bands which been brought about to play music of a distinctly ecclesiastic nature sometimes in the galleries of churches. The repertoire of the early Victorian brass bands, in the absence of a wealth of popular secular music written and arranged specifically for them, would include a lot of arrangements of religious and classical music. It is possible that some of the musicians at this time had experience across both types of band. To run a brass band required more than the efforts of a single spirited individual. As now, it would be common for a brass band to be organised and run by a committee of officials, with a President, Secretary, Treasurer and other roles such as a Librarian to curate the band’s collection of score. But by far the most influential role over a band’s musical success and quality, the hub of any brass band, is its bandmaster. The bandmaster, generally an accomplished performing musician in their own right is usually the leader and conductor of the band, but with an additional skills of being able to tutor and encourage the best from a band, as well as give it musical direction. Wherever Francis Dinsdale picked up his musical skills, he ensured that his children also similarly took up those opportunities. His sons Anthony (or ‘Tony’), Francis and Edward all became bandsmen, and, Tony and Edward absorbed the skills of conducting. It is probable that Francis Dinsdale received musical instruction before the New Shildon Saxhorn Band was formed, and that something about him made him an ideal ‘bandmaster in the making’. But he was not the Saxhorn Band’s only conductor in those early days. We know that of two early conductors of the New Shildon Saxhorn Band at contest; one being Francis Dinsdale, and another who possibly briefly aided Francis Dinsdale’s musical development as a bandmaster, was Mr Robert De Lacy. De Lacy, born in York, around 1831, into a family of bookbinders that later settled in Sans Street, Sunderland, had led the Wear Royal Yacht Club Band at the Bishop Auckland contest in 1857 so may have been known to the Shildon band from that event, or previously. He was never resident on New Shildon, though, it would appear that De Lacy, a solo cornetist, would proffer his services wherever they are needed. It’s documented that as well as conducting River Wear Yacht Club Band, Allendale and, at the same Barnard Castle contest of 1859, not only Shildon but also Stanhope. It’s possible that in the early days of the brass band movement there would be so few experienced conductors that to secure the services of one for a contest might give a band an edge. In the meantime, the bands without an expert conductor might develop one of their own, or else persuade one to make their services permanent. Brass Band Contests not only helped incentivise a band to improve and attain a higher standard but also enabled individual band members to experience the world outside the confines of their own town or village. The continuing expansion of the railway network enabled bands to travel to contests, and in many cases, the patronage of employers contributing payment for travel to contests or concerts helped narrow the gulf between management and the workforce. Some even felt it contributed to a reduction in strike activity following some troubled decades early that century. We know from a newspaper report that on Saturday 24th July 1858 at a reportedly chaotic band contest and horticultural fete in Darlington that Francis conducted the New Shildon band while Robert De Lacy conducted that of the Wear Royal Yacht Club. Of the 13 bands competing the latter achieved the better result, coming third overall. Robert De Lacy is then known to have conducted the Shildon Saxhorn Band at the Barnard Castle Contest at the end of August 1858, where an improved performance saw the band taking on, among others, the short-lived New Shildon Philharmonic Band, and coming second, from six, playing an arrangement of the ‘Hallelujah Chorus’ and ‘Il Trovatore’. One reporter wrote, “They performed the task with extreme care and in a manner which clearly showed that they had undergone diligent training”. The respect for Mr De Lacy is perhaps demonstrated by the fact that at the end all the bands united under his conductorship to play the national anthem, as was the custom of the time. The Durham County Advertiser of the day reported on 3rd Sep 1858 that “One could not but notice the performance of the Darlington and Shildon Sax-Horn Bands, which was fully up to the mark to which their long practice should bring them. The announcement of the result was given amid breathless suspense”. Darlington was awarded the first prize. It seems a more involved agreement had been reached over De Lacy’s services, which may have contributed to this improved form. The Durham Chronicle on Friday17th September 1858 reported: “PRESENTATION. – The New Shildon Saxhorn Band presented Mr De Lacy, their tutor and leader, with a handsome vase, on Tuesday last, as a mark of their esteem and regard for him personally, and as a musical teacher. Mr P Robinson, of Bishop Auckland, furnished the testimonial”. The running of a brass band wasn’t all about contests, though. The Kendal Mercury of Saturday 11th December 1858 reports that a brass band from Shildon featured as part of an evening of celebration at the Railway Hotel (now the Old Well) in Barnard Castle following the opening of the Deepdale Railway Viaduct, a 161 feet high cast iron lattice bridge on the route between Barnard Castle and Kirkby Stephen designed by Thomas Bouch. The following year, at a contest at Polam Grounds, in Darlington on May 31st, Francis Dinsdale was the named bandleader, and again Robert De Lacy conducted. New Shildon came fourth. However as the Newcastle Daily Chronicle of 7th June 1859 tells of a Grand Brass Band Contest and People’s Festival at the Northumberland Cricket Ground, Newcastle-On-Tyne, on Whit Monday, Robert De Lacy is the conductor of the ‘Allendale Town Saxhorn Band’. Also among the sixteen bands competing in that contest, for fifteen pounds and a silver medal for each band member, is New Shildon Brass Band now under the conductorship of Mr F Dinsdale. The band leader at that time was reported as Mr John Gornal. It appears from other contemporary newspaper reports that De Lacy’s services were also courted by Stanhope Band and his influence over New Shildon had decreased. De Lacy again conducted New Shildon Band at the Barnard Castle contest in September 1859 where Shildon was unplaced, but De Lacy’s other band at the time, Stanhope, took first prize. Interestingly at that contest, there was also a Bolckow and Vaughan’s Band, of Middlesbrough, competing. Messrs. Bolckow and Vaughan, as mine owners, both having a Shildon connection and having parallel streets in the west of the town named after them. The bandsmen of Shildon were, through their involvement in the band, privileged to have been able to witness spectacular events in places away from their hometown. The Derbyshire Courier reported on 2nd July 1859 that the Shildon Band would participate at a “Monster Brass Band Contest and Gala” at the Chesterfield Recreation Ground on Monday 11th July 1859. Featuring 25 bands and 390 performers, “After the First Part of the Contest the whole of the bands will form an immense circle and perform “Rule Britannia” and ” The National Anthem”. Also promised was “Illumination at night by various coloured lights”. On the 10th and 11th July 1860 a huge national brass band contest; Enderby Jackson’s “Great National Contest”; was held at the Crystal Palace in London featuring one hundred bands from all over the country. New Shildon Band competed on Tuesday 10th under the leadership of “T Dinsdale”. Excepting the possibility of a misprint, this would be ‘Tony’ Dinsdale, Francis’s son who would have been around 23 at the time. Robert De Lacy, on that same day, conducted Stanhope Band. Such contests, where bands from across the nation gather in one place, may well seem commonplace in the modern era. Yet, at that time, it would have been an unprecedented spectacular and a national sensation only made possible through the expansion of the railways and recent popularisation of rail travel. The cost, and organisation necessary, to transport a whole brass band by rail to the capital, and accommodate them, would not have been insignificant. It’s not clear how this was achieved, but unlikely that it would have been achieved without the benevolent patronage of the New Shildon townspeople or businesses. Then there was the matter of acquiring music for the band to play. In this era, much of the music a brass band could play might be adapted from the repertoire of church music, or converted to the brass band format by an arranger from a wealth of classics and opera. Some of the pieces the bands played would also have been introduced to the growing brass fraternity (and it was a largely male pastime) from the Military Banding tradition. Then early in the 1850s, we see the emergence of the phenomenon of Brass Band Journals. These were usually monthly publications started by enterprising composers or publishers usually with a respected background and both reputation and experience in band format music. When you consider band music, the parts for all the instruments are different and complement each other. The idea was that with each issue of a Band Journal, all the parts for each instrument, for the featured compositions would be provided. Such journals often tried to cater for both the Brass Bands and included additional reed parts to include the Military Bands. At the beginning of 1852 Boosey and Sons of 28 Holles Street, London, launched their Boosey’s Brass Band Journal, one of the earliest and most successful. Boosey’s being one of the early forerunners. This journal, produced in London, was one of the first to be advertised and available nationally. Most of the journals that were introduced came after that point in time and tended to be created and published and distributed from London. These included Chappell’s, published from around 1860 by Chappell and Co; Distin’s, from about 1862 onwards; Davidson’s also starting in 1862; Sidney Jones’s, also in 1862, and the Universal Brass Band Journal from 1860 which was arranged by its namesake, one time bandmaster of the Essex Rifles. There were journals published from the regions too, such as Mr R. Smith’s Brass Band Journal from Leeds, reputedly favoured by the Leeds Model Band, The Champion Brass Band Journal published by Richard Smith of Hull, and Tidswell’s, also of Leeds. Brandon’s published by the musical instrument retailer T Brandon of Barnard Castle. Some, such as the Wright and Round Brass Band Journal based in Liverpool, would flourish and evolve. Others such as Brandon’s Brass Band Journal, published by Mr T Brandon of Barnard Castle, would fall by the wayside in the face of stiff competition. The format and makeup of the Brass Band had not entirely been standardised so it would seem that some bands would structure themselves to suit the makeup of the published music making it difficult to switch between Journals on account of each having a slightly different formula of players and instruments. It was otherwise necessary to transpose or adapt published pieces to suit the players and instruments that you had. That may well have been a skill a bandsman or bandmaster may have had to acquire en route to becoming a composer. Publishers of Brass Band Journals would often ensure that they were issued as prizes at contest perhaps to strengthen their circulation. The reason I highlight the emergence of the Brass Band Journals here is that, in later years, after his involvement with the New Shildon Saxhorn Band, Robert De Lacy would also publish one of the Brass Band Journals of the day. Later still we will see too that the Journals would play an important part of out two central figures. Of what happened to Robert de Lacy, after his involvement with the bandsmen of New Shildon, we know this. On Oct 24th 1861 he joined the Palatine Lodge 97 of Freemasons, listing his profession as Professor of Music. The lodge appears to have a number of such professors as members. It’s uncertain whether Robert held a formal teaching post. At some point before 1871, he moved from Sunderland to London where he was living with his wife Eliza, in Lambeth, as well as a son Charles John and daughter Rosamond, both of whom were born in Sunderland. But by 1881 he was a widower with his Rosamond and a widow Louisa Hill from Bath. While in London, brass academic Roy Newsome tells us that he established the London Brass Journal, to which he was a principal contributor, meaning that De Lacy was a composer as well as a teacher of music. We’ve seen advertisements for his Journal as early as 1866 where it was being published and distributed in Southwark, but later we see it being published, and sold, from his music shop in Brixton, London. This became by July 1888 the London Brass and Military Band Journal. De Lacy, through his music shop, was also involved in the manufacture of own branded musical instruments. He does not appear to have been prolific as a composer and we don’t know what proportion of the music published in his journal was penned by his own hand. One De Lacy piece we have seen references to having been played, on one occasion, coincidentally, as part of the same programme of music as a George Allan piece, is the reminiscence of war composition “Tel El Kebir”, which was most probably written after the battle that occurred there in Egypt on 11th September 1882 wherein Lieutenant Colonel Garnet Wolseley’s British and Indian Army contingents overcame the entrenched Egyptian defences of Ahmed ‘Urabi as part of a campaign to control the Suez zone, so critical to western trade and travel at the time. It seems there’s nothing like a military victory in a far-off land to inspire a Victorian march. There is also mention of a De Lacy piece called “White Rose” played by the Cumberland Band in Australia in 1914. He was for many years one of the Vicars Choral at St Paul’s Cathedral, where he was a bass part singer. For part of this period, the organist was Sir John Stainer, who would be tremendously influential in helping to shape the format of Victorian musical education. Though we will mention Robert De Lacy again in this history, ultimately we know that he died on 20th December 1908 while he was living in London at 84 Holland Road, Brixton, Surrey leaving his one time lodger, but by then wife, Louisa £772. That Robert de Lacy had ties to the Shildon bandsmen and that two of those went on to be so highly engaged with the brass band journals of their day, both founding their own, is interesting. Robert’s son, Charles, went on to be one of the foremost British marine artists of his period, known especially for his warship imagery. He was trained at The National Gallery and the Illustrated London News was one of his patrons – he exhibited at the Royal Academy in 1889. Returning to the Dinsdale family, whom as we mentioned had originally lived in Strand Street, New Shildon, we know that at some point between 1851 and 1861 they moved the short distance to the newly built, terraced, Adelaide Street. This terrace street comprised some 95 new houses principally for the accommodation of workers associated generally to the railways, and mostly from the nearby North Eastern Railway works. There were two sites to the works. One that had grown first in the area around the Soho Works where Hackworth had developed locomotives, and another which grew to the south-west specialising in wagons. The houses in the streets between were homes to an array of engine drivers, engine ‘feeders’ (feeding coal to the locomotive), engine smiths, railway agents, joiners, works clerks, iron turners, boilersmiths, blacksmiths, brass moulders, railway gatekeepers, joiners, wagonwrights and cartwrights. The wives fulfilled demanding roles of running crowded homes tending to large families in an era of little convenience. Some wives doubled as dressmakers. Working-age children were sometimes colliery screen boys (opening and closing ventilation traps down in the mines), but more often apprentices and general labourers. ‘Working age’ generally commenced far earlier than we think of it now. Adelaide Street, of which but a stub remains today, was reputedly named in honour of Princess Adelaide of Saxe-Meiningen, the spouse, and queen consort to King William IV, who had passed away in December 1849. Through this naming Adelaide Street shared something in common with the city of Adelaide, the capital city of the state of South Australia which was founded in 1836 after South Australia was officially proclaimed a British Colony the same year. It would be misleading to think that the street was named after the now famous city. This fact was probably not lost on Francis Dinsdale, whose own brother Anthony, after whom he most likely named his first son, had himself emigrated to Australia, most likely as part of an incentivised emigration scheme. There are many reasons that British nationals left their homeland for Australia during the mid-nineteenth century. The initial deportation of convicts under penal transportation continued to be a practice until 1868, though there was also a significant voluntary emigration, particularly during the ‘gold-rush’ period that began in 1851 which particularly attracted workers with backgrounds in mining or engineering. Also in the 1840s and 1850s, there was an Assisted Immigrants Scheme and prior to that a Bounty Scheme both of which provided incentives for encouraging emigrants to Australia that fulfilled certain criteria, primarily to address labour shortages, but also to boost, and keep dominant, the British population of the colony. Anthony, like his brother Francis, had spent time moving to find work with his wife and young family but in 1851 had settled briefly in Bradford, drawn by work opportunities in its mills. Within four years, for whatever reason, the family had reached a conclusion that to spend the rest of their lives in Australia offered a better prospect. Anthony had set out to Australia aboard the Nashwauk on 13th Feb 1855 from Liverpool, with his wife Anne, and children; Thomas, aged 17; Margaret, 15; Esther, 12; John, 8; and Isabella, 6. However the voyage had fared, the family’s arrival in Australia was certainly to be traumatic. On what was, according to the ship’s log, the 89th day of the voyage the Nashwauk, a 762 ton Canadian built wooden ship that was only 18 months old at the time, crashed into the shoreline south of the mouth of the river Onkaparinga, south of Adelaide. This was at 3 o’clock in the morning of May 12th 1855, so likely to have been a complete shock to passengers and the bulk of the crew alike. Local people there removed the stranded passengers and took care of them until local steamers arrived to take them north to Adelaide. Understandably many of the travellers were reluctant to take to the water again and were transported instead by carts hauled by bullocks and other land-based means. A newspaper reporter from the South Australian Register attempted to determine and report the cause of the tragedy. The ship’s captain had been below deck, having taken watch the previous two nights, leaving the second mate at the helm. The second mate claimed to have mistaken a light onshore for a lightship. Whether it was as an eventual consequence of that collision, or due to some other cause, which potentially might have been worsened or triggered by that event, Anthony Dinsdale died less than a month later in Adelaide on 7th June 1855. 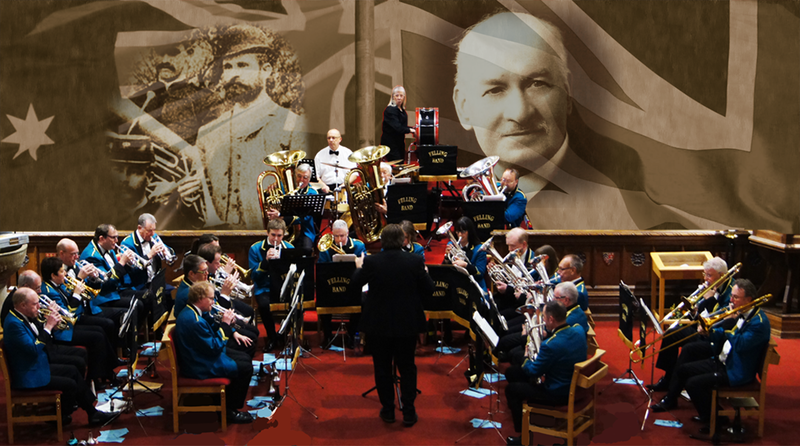 Back in England, Francis Dinsdale and his sons, worked hard to strengthen and improve the brass band they had helped to establish in New Shildon. As well as competing for the town’s pride in brass band contests across the region they ensured, as far as possible, that the band were the ‘go to’ source of entertainment for any, and every, public occasion in the vicinity of the Shildons. Any sports meeting, parade, horticultural show, religious festival or opening of a new facility worth its salt would be no spectacle at all without the novelty of a brass band to ‘wow’ the attending crowds. More prestigious events, or occasions, with the means to do so, would employ the services of a military band from Britain’s armed forces. Britain has long had a strong military band tradition to provide both marching and field music, as well as ceremonial and funerary music. Though it seems remarkable, and possibly even impractical, now military bandsmen once played a key role on the battlefield in the direction and control of troops and troop formations. Globally the idea of the military band is very old. In Britain, though it was not made official until 1762, the oldest extant British military band is considered to be the Royal Artillery Band: its unofficial roots go back to the 1550s. The military bands differ from brass bands through the array of instruments used. A military band includes more drums, added percussion and woodwind instruments. The clarinet and piccolo add to the upper end of the aural spectrum in military arrangements. Another key difference would have been that military bandsmen would be professionally tutored, musical performance is an essential part of their ‘job’. Thus they were perhaps more respected, publicly, for their art than the evening hobbyists of the industrial communities. In addition to the formal military bands assigned to official units of the armed forces there were, nationally, an array of militia bands following a similar format, but comprised of members of non-professional soldiers drawn from the civilian population and held in military reserve. Though different to the brass bands, these bands would still influence the brass band movement through the migration of players between the two forms of band. The members of localised amateur brass bands such as the New Shildon Saxhorn Band had long, and often very physical, working days to complete before music was even a consideration. Excepting the most fortunate individuals, or most passionate and dedicated, the liberty to convene to play music together was a rare pleasure, an escape and possibly even a welcome distraction from an otherwise crowded home. Membership of a band brought another form of camaraderie, different to that established in the workplace. Given the speed of emergence of the brass band scene, and the scarcity of authoritative local judges, at some early brass band contests a military bandmaster might often be employed, should they be available, to adjudicate. They were considered more qualified to decide on the quality and execution of performance. In a reflection of military values, on occasion, points might be scored for the presentation of physical appearance and regularity of marching as well as for how the music was played. The press of the period reveals, in part, the gulf in how the two types of bands were initially regarded. This example from the Durham Chronicle of 10th Sept 1858, which refers to two Shildon bands, is a telling example. “A band contest was one of the minor features of the show. This came off between four and six o’clock when the Artillery Band had left. The entry of competitors was small and the interest attached to their performances was not very marked. Coming as they did after so splendid a musical treat, the public was naturally in an unsympathetic mood, and therefore the contest was – except to friends and acquaintances of the men engaged – a somewhat flat affair. The order of playing was, as usual, decided by lot; and the bands went onto the ‘rostrum’ in the following order: 1st Shildon Philharmonic: 2nd Stanhope;: 3rd Shildon Saxhorn; 4th Auckland. Haydn’s ‘Heavens Are Telling’ was the test piece – a noble composition as all ecclesiastical musicians declare, and having a Handelian suitability for orchestral power. We cannot say much for either performance. There was however a marked superiority in that of the Stanhope men – so marked that Mr Smyth’s award only confirmed a conclusion already arrived at in the public mind.” Shildon Saxhorn came third to Shildon Philharmonic, and subsequently, for whatever reason, noble or otherwise, returned their prize to the event committee. The typical selection of music that one might hear at a concert performance by a military band might be considered surprising. Professor Stephen Martin, in his research into the Bishop Auckland Flower Shows of the Victorian era, discovered that the programmes of music contained significantly sophisticated pieces being performed by the likes of The Band of the Coldstream Guards and of the 2nd Light Infantry. Where the article mentioned above refers to a ‘splendid musical treat’ it’s unlikely to be an exaggeration. More a justifiable reaction to a demonstration of musical skill that might only be achieved through dedicating one’s life to its improvement. Little wonder then that the masters of such bands, men such as Charles Godfrey, one-time bandmaster of the Coldstream Guards became influential and revered figures among amateur brass bandsmen. The military bands would, however, only be available for occasions of a certain stature. There were plenty of events, occasions and parades in the annual calendar of a growing town like New Shildon to keep the amateur bandsmen of Shildon busy. As with all the emerging bands of the day, the more they played, the more they would improve. As they improved they gave great pleasure to their community. The New Shildon Saxhorn Band could be engaged by organisations within the near and surrounding community to lead a variety of parades, for example as the Durham County Advertiser of 11th August 1865 tells us when the St John’s Lodge of Oddfellows M.U. celebrated their 25th anniversary on Saturday 5th August, it was the New Shildon Saxhorn Band that marched at the head of the procession with the banner of the order, from the lodge room at the Talbot Inn, West Auckland to the church for a sermon. Throughout the Victorian era many friendly and mutual beneficial societies such as these Oddfellows, as well as the Foresters and the Druids emerged. At a time when there was no welfare state, they gave an opportunity for people to join and contribute to a common fund while they were able on the assurance that when they found themselves later in need the society might be there to aid them. As time progressed Francis’s Dinsdale’s children bean to grow up and start families of their own. On November 28th 1857, Francis’s 18-year-old daughter Margaret Dinsdale married 21-year-old Thomas Bulshey, originally from Yorkshire. Though the marriage took place in Auckland parish it is quite possible that the couple first met when they were both living separately in Darlington. The young couple set up home on Strand Street, parallel to Adelaide Street, and by the time of the 1861 census they are registered under a shortened spelling of the surname, Mr & Mrs Bulch. Why the family surname changes from Bulshey to Bulch is something we can’t be certain of but it is likely to have been a deliberate decision as the surname Bulshey appears on other public documents for family members prior to the 1861 census. Thomas and Margaret wasted no time in starting a family. Their first child Mary Jane was born in 1859, followed by Ellen in 1860 and then Francis, likely named after his grandfather, in 1861. Thomas appears to have enjoyed growing flowers, and in August of 1860 he exhibited dahlias at the Bishop Auckland Flower Show which was a major event on the regional calendar at that time. Specially arranged excursion trains came into Bishop Auckland from all directions, Leeds, Newcastle, Darlington, Sunderland, Barnard Castle and Durham in a complex logistical exercise conducted by the railway companies. The show took place in the Bishop of Durham’s park, with the gates opening at 10 o’clock to admit the masses. The Royal Artillery Band from Woolwich, with its ensemble of seventy performers, gave a grand promenade concert. Marquees, for exhibiting flowers and vegetables, were erected in a valley by the gently bubbling River Gaunless. Thomas’s entry of six varieties of best dahlias won him third prize in the cottagers class, which included a 5 shilling cash payment. 8. A day that almost changed everything. In the years following Thomas and Margaret’s marriage, Thomas was employed by the Stockton and Darlington Railway, the first passenger railway company in the world, as an ‘engine feeder’, or as more commonly known now a locomotive fireman. He had been in this role since February of 1854. This involved standing on the footplate of a locomotive with the driver of the train transferring coal by shovel into the firebox evenly in the correct quantity to ensure that sufficient steam continues to be produced to keep the locomotive in motion. It would be hot, and physical, work. It was also almost the last step in a career progression to become a locomotive driver. This could well have been an aspiration for Thomas Bulch. The events of one late summer day in 1861 would see Thomas led down an entirely different path. In 1861 the Stockton and Darlington Railway were celebrating a new partnership and the opening of a new line. The South Durham and Lancashire Railway had been created by the S&DR to connect Bishop Auckland in County Durham with Tebay, enabling onward travel to the Lake District and Cumbrian towns. Work commenced in 1858 on this route heading south-west from Bishop Auckland through Barnard Castle and Bowes then, taking a detour around the Duke of Cumberland’s holdings, over the moorland into Cumbria via Stainmore crossing four newly built viaducts along the way, at Tees Valley, Deepdale, Belah and Smardale Gill. Interestingly, Thomas Edward Bulch’s grandfather Francis Dinsdale’s New Shildon Saxhorn Band had entertained at the celebrations following the opening of the 161 feet high iron lattice Deepdale viaduct in December 1858 at the Railway Hotel (now the Old Well) in Barnard Castle. You can still see the embankments and cuttings of the route the line followed if you visually trace the landscape westward from Bowes, or north from Barnard Castle, using an online satellite mapping view like Google Earth. It’s a landscape which, unlike our towns that have since been extensively re-modelled, would have changed relatively little since 1861. Parts of the route are now preserved as public walkways. There has been an attempt at Stainmore to revive a stretch of the railway in a 1950s style reflective of the era before Dr Beeching’s decimation of the British railway network. Otherwise, though, it’s as leak a landscape now as it ever was during Queen Victoria’s reign. Up until 1861, the Stockton & Darlington Railway has been primarily about the movement of minerals and goods, but there was an increasing demand for passenger services, and locomotives suitable to haul them. Two new 4-4-0 locomotives were commissioned by the S&DR to operate on this line; “Brougham” and “Lowther”. They were designed by William Bouch (who had been an apprentice of Timothy Hackworth at Shildon, and risen to become the Chief Superintendent of the Stockton and Darlington Railway) and built by Robert Stephenson’s locomotive works on Tyneside. However, despite the introduction of the new 4-4-0 locomotives, a number of 0-6-0 mineral locomotives such as “Gazelle” were also used for leading passenger trains. The route was famed for its harsh and inhospitable weather, and the locomotive crews, over time, revelled in their resulting reputation as being ‘hard men’ for bearing it with little but a turned up collar and an open cap to protect them from the wind, sleet, snow and rain. Though not as open as the footplates of the very early locomotives, the footplates of the 1860s were far more exposed to the elements than those we see in later decades. The route had been followed by mineral trains since July 1861, and yet the formal opening ceremony of the South Durham and Lancashire Railway did not take place until the 7th August. Passenger traffic commenced, promptly, the following day. The incident of interest to us occurred three weeks after the opening, on Thursday 29th August. The locomotive crewed by Thomas Bulch, and driver Robert Aaron, on the day in question was later identified by the investigator, Captain Tyler, as Locomotive No. 1491, which had been built in April 1860. The events of the day were reported, most ably, in the Durham Chronicle on Friday the 6th September in an account I am unable to improve upon, so reproduce as it was printed. The first pleasure trip to the lakes was taken on Thursday, the 29th ult., over the new line from Barnard Castle to Tebay, and accommodated about 400 excursionists from Darlington and Barnard Castle. The train steadily driven to its destination at Windermere, the journey was fully enjoyed, the weather being delicious throughout, and the scenery beyond Winston an uninterrupted succession of ever-changing beauty. Amid Wordsworth’s favourite haunts the party spent eight merry hours, rambling over mountains and glens, gathering ferns, and listening to the echo of “the post horn.” No happier day till 5:30 p.m., when the train started punctually from Windermere, was ever passed. During the return journey, especially on this side of Kirkby Stephen, many of the passengers, and among them Mr Geo. Brown. the secretary of the new line, observed a recklessness of pace; the gradients being somewhat hazardous, the way perhaps not consolidated, and the curves extreme, excited general alarm. All at once, close by a cattle creep or bridge, near Low Spittal, three miles west of Bowes, the engine got off the line, and ploughing down the embankment, jerking, shuddering, so to say, bounded into a peaty field, there stuck fast flat on her side. This happened in a shorter time than it takes to write it. The hour, 7:45 p.m., was closing on the lovely day, with thick gathering clouds and hurrying darkness. There was but one first class carriage which, and another covered, with the last van, maintained their position. The five others were pitched athwart, in odd directions, and many of them smashed, but the coupling chains kept entire. After the first pause in excitement, in which men live their lives again, all that could escape bolted through windows, the doors being locked. One man, Mr Fortune, states that before he came to his senses he was spanbowed through the window, such the violence of the concussion. The others, stupefied in heaps, or stunned dotted here and there, were hauled out, some with superhuman effort and incredible difficulty; some were silent, others tumultuous, and the scene altogether beggars description. Had this untoward affair occurred a few yards on either side of its point, by nothing but a miracle could a single individual have escaped. As it was, taking into account the terrible shaking and horrible alarm, all suffered; for many feeling themselves wonderfully right on Friday, had to call in advice and keep prudently quiet afterwards. Mr Foggett, of the High Row, was found with his collar bone fractured; Mr Ridley, whitesmith, a similar catastrophe, and internal injuries; Mr Michael Watson, builder, who bled profusely, had his head cut; Mr Fortune, his wrist and chest injured; Mr Railton, his wrist dislocated; Mr. Dunning, shoemaker; Mr. Dunning, of the George Inn; Mr. Harrison, silversmith; Mr. Spence, seedsman; Mr. Lee, bookseller; Mr. Maitland, Mrs Wallis, Mrs Edmondson; Mrs Crabtree, and Mrs Wray, all of Darlington; Mr and Mrs Smith, and Mr and Mrs Moore, all of Cockerton; and old people; were hurt, some seriously. Many had black eyes, others were cut in various parts; one his teeth knocked down his throat, and some suffer internally. But these were trifling, though bad enough. Dr Torbock, the only surgeon present, and prepared with all the means and appliances necessary, attended to his unexpected patients at once. To the horror of everyone, it was also discovered that the engineman and stoker were actually buried under the engine; their position seemed hopeless, such was the nature of the ground; the awful weight and ponderous mass above them struck every one with the idea that any attempt to extricate them, without the aid of mechanical contrivances, would be futile. The wounded cared for, to the praise of a few – only a few alas – for many there were who refused to help, skulking away unconcerned, a prey, it is to be hoped, to their own remorse – the utmost energy was directed to those poor fellows. The gloom of the blackest night, intensified by a furious howling wind and pelting rain, which Stainmore knows well to show, added to the baffling difficulties of every one. Fence rails torn up, splinters of carriages gathered together mixed with hay from a neighbouring stack, soon made a prodigious crackling blaze, and the sparks darted along with the angry wind, a distance between the High Row and the church gates. Under the fire, cinders raked from the coal-box fell upon the victims, and any attempt to slake it only added to the horror of the steam which scalded, and the styth which affected them. What a scene this for Salvator or Van Schnendel, or our own wondrous Turner! If there was leverage enough the weight could be easily raised, but the difficulty was a fulcrum. Big plates were brought from the line, and hard work it was; for in uncertain light and intense darkness, boggy holes lay treacherously in the way; but good hearts never give in. Plank after plank, and stone after stone, sank down, and then at length the engine was moved; but only unfortunately to increase the poor men’s pain, and add fresh anguish to their hopeful friends. Struggling thus till 11:30 p.m. – what a time it was! – the night seemed like three. By some unaccountable blundering with the telegraph at Bowes, whence stupid, selfish, contradictory messages went home, the lateness of the hour, and the awkwardness of a single line, it was not until the opportune time help came from Darlington, when exhaustion seemed almost to have worked its inexorable will. From that time nothing was wanting – the chief secretary, with heads of various departments, and their workmen, took the matter in hand. The fireman, Bulsh, whose case is the far more serious of the two, was rescued before the brave excursionists departed. Aron, the other man, buried for 8 hours, was not got out till after 3 a.m. Both were taken to their homes at Shildon; and each lies very ill – burnt, and scalded, and crushed. The special trip came cautiously back – arriving at Darlington between one and two; the excitement being intense. And thus, despite the broken leg, the scalding and burning and eight hours spent crushed beneath the locomotive, Thomas Bulch lived. We know from his employment records that we discovered at the National Archives in Kew that the very next year, on March 10th 1862, he changed his occupation to be ‘timekeeper’ at the railway wagon works in Shildon. The timekeeper’s post, as we learn from the railway company’s pay books which are held at the National Archives in Kew, was not especially well paid, earning four shillings and four pence per week, certainly not as much as a locomotive driver. However, he was at least alive and given the injuries sustained in the accident, and the probable mental trauma, it’s now really quite understandable that Thomas Bulch may have been unable to continue to crew locomotives. 9. The Births of Thomas Edward Bulch and George Allan. On 30th December 1862, Margaret gave birth to yet another baby boy whom they named Thomas Edward Bulch. Had Thomas Bulch senior not survived the rail crash it’s clear that Thomas Edward would not have been conceived and born, and we’d not be telling his story. Overall, between 1859 and 1880 the couple would have thirteen children, however, it is Thomas Edward who is to be central to this story. Just under fifteen months later, on the 21st March 1862, George Allan was brought into the world. George was the third child of John James Allan and his wife Hannah (née Longstaff). John James Allan had been born in Ellerton on Swale in Yorkshire to William and Martha Allan, and his journey to New Shildon had taken him via Crakehall, near Catterick. That is where he appears to have met and married Hannah, and started their family; George’s older brother, William, being born there in 1859. Along the way John had spent time as a farm servant at St Giles’ Catterick at age of 15 in 1851 and somewhere between then and 1861 learned the skill of Tailoring. It is as a Tailor that he established himself initially in Chapel Street, New Shildon hardly anything of which still stands today. It can be seen where the Locomotive public house meets Byerley Road, quite close to Adelaide Street. Over the years John and Hannah would have 9 children. George’s birth certificate tells us that he was born there at Chapel Street. At that time, as well as his older brother William, he also had an older sister Eleanor Mary, also born at Chapel Street, just 1 month before the 1861 census was taken. That census also reveals that at that time the Allan family were being visited by an Eleanor M. Buck, and it seems possible that young Eleanor Mary Allan was named after this lady. However she the unfortunate infant only survived until the spring of 1862. Surviving infancy in the mid-nineteenth century was an achievement in itself. John James wasn’t the only member of his family Allan to have moved to New Shildon. Shown on the same census, but living alone on Adelaide Street, is John’s older brother, Ralph, working in New Shildon as a shoemaker. George’s Uncle Ralph married and settled in the town, with him and his wife (also called Hannah) giving George and his siblings cousins; Martha, Alfred, Ralph William, Sarah Hannah and Emily Ann. Wherever the Allan brothers learned the skills they brought to New Shildon, it seems they came to the town to provide clothing and footwear to the growing population. That by the time of the 1871 census, John James Allan’s occupation is stated as Master Tailor suggests that however he came by his profession he was a man of some significant skill in that field. The world into which Thomas Edward Bulch and George Allan were born was quite different to that we recognise today. It is probably worth taking a moment to set a context. When George Allan was born, Queen Victoria was enjoying her 26th year as British Monarch. A Liberal, Viscount Palmerston as Prime Minister oversaw the British government as house elected only by male adults over 21 years of age that owned property. By the early 1860s, only around 1.43 million could vote out of a total population of 30 million. Furthermore, the lack of secret ballots resulted in open voting. This meant that voters could be, and often were, offered bribes or be subject to intimidation in order to vote a certain way. The Clifton Suspension Bridge in Bristol was completed around that time, as a memorial to its innovative designer Brunel. Charles Dickens’s ‘Our Mutual Friend’, one of his most sophisticated works, combining savage satire with social analysis was being serialised in the newspapers. In science, John Alexander Reina Newlands produced the first periodic table of chemical elements. In Paris, the first ‘true’ bicycle with a cranked front wheel was created, sparking a Victorian craze for cycling. There was significant social change in this period, as the proportion of the population that could be considered ‘middle class’ was swelling. Up and down the country ‘middle-class’ men now managed factories, traded stock, wrote in ledgers, oversaw building sites, and sparred in the law courts. They made their fortunes and tested their mettle by competing with their colleagues. Even before Charles Darwin’s ideas about natural selection began to circulate in the 1860s, the Victorian middle class of the mid-nineteenth century perceived life to be, essentially, one long competition. Victorians believed it should be theoretically possible for any man to succeed in the world through his own efforts no matter how humble his origins. Self-help literature, manuals of etiquette and moral standard and aspirational novels such as ‘Great Expectations’ were widely read. To fail to reach one’s potential in such times was deemed to be a flaw in the character of the individual, rather than the society as a whole, with the desolation of the workhouse awaiting those too lazy, extravagant or proud, to avoid poverty. Closer to home, New Shildon and the surrounding area had, not unusually for those days, a reputation for hard drinking and disorder. The construction of the railway infrastructure and the town itself had continued to draw tough, physical, workers, and pay them comparatively well. These men had a thirst for ale and trouble. After Robert Peel’s Metropolitan Police Bill of 1829 an emerging collection of police forces grew nationally and by the mid-1800s there was a local police presence that would attempt to keep order on behalf of ‘the establishment’ and suppress petty crime. In doing so they were as likely to be physically attacked in return. Throughout the childhood of Thomas Edward Bulch and George Allan, newspaper reports of the locality tell tales of robberies, theft, widespread domestic abuse, physical assaults on both men and women in the home, alehouses and on the streets. A variable approach to health and safety concerns in the local industries resulted in injuries and fatalities of men at work. It would often take only a mishap, or slight distraction, for a railway worker to find themselves crushed and injured or killed by rolling stock. If rendered an invalid the worker had no welfare state to fall back upon for support, and would often depend thereafter upon the goodwill of their family. The industrial environment was a hazard not only to the workers but the local children. A story of 1869 (when Thomas would be around 7 and George a little younger, a one-year-old girl called Mary Ann Bell was killed as a result of an accident when children had been riding in a ‘bogie’ and she reportedly fell out fatally injuring her spine. Another example from 1863 tells how an eight-year-old boy, John Thompson, was crushed to death after falling off rail wagons he had been riding. Thomas Edward Bulch was Christened in the presence of his parents and family, in Shildon on the 28th January 1863. This would have been at nearby St John’s Church as New Shildon did not have its own church until later that decade. Over a year later, on 10th April 1864, George Allan was also Christened. At some indeterminable date between 1861 and 1871, the Allan family moved from Chapel Street to Adelaide Street. The effect of that is that in that year the Bulch family, the Allans family and the Dinsdales all lived a few doors apart; albeit with the Dinsdales and Allans being on Adelaide Street and the Bulch family living in Strand Street, which ran parallel. As infants, it is highly likely that both lads knew each other and probably spent time in each other’s company. At the south end of both terraces was the spot where railway tracks led through an entrance to the second of two railway works; the other being Hackworth’s original Soho works to the east of the small town. The railway lines that led into the new works crossed a road in front of the Mason’s Arms from where Locomotion No.1 hauling the first ever passenger steam train, had set out in September 1825. It is probably to the railway company that both boys would owe a debt for the quality of their early education. The British School, that was located where Station Street meets Cross Street, was built in 1841 by the, then, Stockton and Darlington Railway Company, to provide schooling for the children of the area and, until it became self-supporting, was kept up by the North Eastern Railway company after it acquired the Stockton and Darlington Railway in 1863. It was a stone building, which over time became of sufficient size to accommodate 300 as a mixed school, and consisted of a large room and two classrooms. The growing town had another ‘National School’ in New Shildon on land above All Saints Church, that wasn’t built until 1875, by which time Thomas and George would be close to finishing their schooling. The British School would have accepted children from the overcrowded little terraced houses in the area that had also been built for the railway workers in streets such as Adelaide Street, Strand Street, Simpson Street, Alma Road, Mill Street, Soho Street, Cross Street, Station Street and Victoria Street, as well as the Soho Cottages. Education in Britain did not become mandatory until the Education Act of 1870, so Thomas and George were fortunate in the 1860s. Generally, childhood in Victorian Britain was far shorter than we think of it now. Children were small people, and the heads of industry up to that time usually found ways to deploy their labour potential for gain. In many communities around the North East children might expect to be put to work in coal mines or factories from an age as young as five, and certainly by age of eight. Though some legislation was introduced in the nineteenth century to curb this or reduce the working hours of children, the industry owners would find ways to manipulate the rules to gain the benefit of child labour regardless. The owners of the North Eastern Railway, fortunately, perceived a benefit in the education of children and their British School would have provided a basic education most likely with a view to providing the railway works with competent workers for the future. Naturally, there would be the chance that some of those children might put what they learned to use elsewhere, but overall the railway company thought the investment in good basic education in elementary competences to be a good one. Overall, Victorian schools had a reputation of providing a strict disciplinarian environment where slate took the place of paper, and the birch switch ensured the keeping of order. It must have been an exciting time and place to witness as a child. Not only had the railway industry been born in New Shildon, bringing with it the hustle and bustle of the industry, but the development of housing and other industries to support the railways, public facilities such as churches, chapels and schools for the workers must have made it a place full of expectation and new surprises. Many services we take for granted today, such as lighting and provision of a fresh water supply, were being gradually introduced to the town. Furthermore, new people were arriving all the time. The year before Thomas Edward Bulch was born the population of New Shildon was 1142. Within ten years, when George Allan reached seven years of age, the population had boomed to 1667. Away from school, and guided by the influences of his father Thomas senior, grandfather Francis Dinsdale and Uncle, Edward Dinsdale, it was almost an inevitability that young Thomas Edward Bulch would learn about music. Eric Tomkins’s superbly researched Bulch family history, based in part upon stories passed down from his grandfather, explain that Thomas Edward’s father had been a bandsman. It’s not known what instrument he might have played or for how long. There is however a newspaper article in the Durham Chronicle that explains how on Friday 7th August 1868 Thomas Bulch Sr. played a key part in the presentation of a special ‘contre bass’ horn to the then secretary of the New Shildon Saxhorn Band, Mr James Robinson at a celebratory event at the Commercial Inn on Mill Street. That Thomas’s father was engaged to present the instrument and make the speech suggests that he occupied a position of respect among those assembled, under the “superintendence of their much respected bandmaster, Mr F Dinsdale”, his father-in-law. It is probable that young Thomas would have seen a great deal of the band as he grew up, and seen how his father, grandfather and uncle, as well as many of those around the family, were involved. It was the piano that was to be Thomas Edward Bulch’s first instrument. The middle of the nineteenth century, through the industrial success it had realised and the new found wealth that had enabled a capitalist society and therein an expanded middle class desperate to show its cultural credentials. Though I’m not suggesting the Bulch family were of that class, there were many among the working classes with aspirations to attain that status. In Victorian Britain, ownership of a piano was, for the lower middle classes of the day, a sign of status, as well as a form of entertainment during long evenings in the years before radio or television invaded our homes to steal our attention and keep us quiet. Its proper name of ‘pianoforte’ being derived from the Italian words for soft and loud, the piano was a versatile instrument and the perfect accompaniment to singing in the home. The importance of possessing a piano in one’s home might perhaps be equated to the early twenty-first century imperative to have the latest flat widescreen television set on display. The changes in design and technology, including the use of cross-stringing where one longer set of piano strings, enabling the deeper low notes, could be placed in the same space across a first shorter set for the high notes, had led to evolutionary variants in format from the cumbersome grand piano to the compact and convenient upright piano that might fit into a corner of modest terraced house whilst still producing a respectable richness of tone. Furthermore, the piano was more than a musical instrument. With a cabinet required to conceal the stringed frame and soundboard as well as the mechanical workings of the keyboard, the piano was a fully fledged piece of furniture, styled to suit whichever aesthetic trend was prevalent at intervals throughout the Victorian era. Music shops sprang up around the region, selling a range of pianos, other instruments, and satisfying the appetite for a broad range of sheet music to play upon them. Some such shops, including Brotherton’s Music, established in Bishop Auckland in 1842, would go so far as to offer their own branded range of piano. As well as learning the piano, the young Thomas Edward Bulch also learned to play the violin. Though learning the piano and violin would have required a great deal of concentration and practice from the young Thomas, it would give him an early understanding of the principles of polyphony (simultaneous melody), monophony (singular melody) and homophony (where a dominant melody is accompanied by chords), which would be a great foundation for a budding composer. The popularity of the piano in the home created a demand for printed sheet music. This enabled the professionalisation of music during the mid-Victorian era. This was something that would catch the attention of the young Thomas Bulch as he grew up. Eminent musicians once limited to performing and composing could now expand into teaching and publishing. New printing technologies emerged to fill the need for mass-produced popular printed music, meaning that as he was learning young Thomas would have access to a wide variety of traditional and new pieces of music. In the period while Thomas was honing his own musicals skills, some of the earlier music by composers whose names he himself would later be associated with, such as Edinburgh’s pianist and violinist Carl Volti, were already freely purchasable. Gradually Thomas Jnr. progressed to brass instruments, though his love of the piano stayed with him throughout his life. We don’t know which brass instrument Thomas Edward started with but we do know that he learned how to play, and look after, a cornet. This would be his instrument of choice throughout his time as a bandsman, and bandmaster. The young George Allan’s route to brass band music appears to have taken a slightly different path. Bob Wray, a former North East bandsman who researched George Allan during the 1980s and 1990s, had the pleasure of discussing George’s life with his, at the time, only remaining Grand-daughter, Dorothy Allan. From those exchanges learned a little about his life that wasn’t recorded in formal sources. It seems that, though there were members of the Allan family with musical ability, George was initially self-taught. His cited influences from articles published later in later in his life, make references to pianists, suggesting that, like Thomas Bulch, he had learned piano. This is also echoed in the storied told to Bob Wray by a former Shildon bandsman named Jack Kitching who began playing in brass bands in 1926 when George was still alive. Though Jack admitted he didn’t know George Allan personally, he was able to recall from what he was told by fellow bandsmen and musicians more closely acquainted, that George would play piano or organ. However, it was not as a composer of piano music that George would become renowned. We can draw from a partly retrospective article printed in The Cornet on 14th November 1896 that George had, as a child, been a member of the church choir. We speculate, from his later involvements with it, and its societies, that this would most likely have been at All Saints Church, New Shildon, which was completed and opened in 1868 when George would have been four years old. This church was built, for the people of New Shildon, on land gifted to the church by John Scott, the 3rd Earl of Eldon and was hence named after the saint’s day closest to Scott’s birthday. George, and probably Thomas too as with millions of others of their generation, were taught to sing using the Tonic Sol-Fa method. This was a means of learning devised by an English music educator called Sarah Glover, then developed and popularised, following a commission by a conference of Sunday School teachers, by a minister, John Curwen; this in a belief that all social classes of people, and all ages, should be able to learn music. The principle was that competence in musical literacy could be achieved by graduating through three phases; initially by reading the sol-fa notation only and then progressing, via an interim stage, to being able to read directly from musical staff notation. This would have been a useful skill when the time came to make a transition to a musical instrument. Though originally created to improve Sunday School singing, the method was adopted in 1860 by the English education authorities, and so George may well have initially started to learn through this method at either Sunday School, school, or perhaps even both. His choirmaster in the church choir recognised a musical talent in young George and, according to that 1896 article from The Cornet, had presented a question; “What can you learn in a brass band as to theory etc?”. George took it upon himself to find out. We can’t be completely certain who that choirmaster was, as church records at the time did not include detail of the post of choirmaster – but it’s almost certain that the brass band community have that individual to thank for the later musical compositions of George Allan. A newspaper report of January 1870 tells us that the choirmaster at All Saints Church was Mr William Dodds, born in 1820 in Darlington, a former railway agent and later insurance agent of St John’s Road, Shildon. He did not pass away until the mid-1890s, so there’s a significant probability that he was the choirmaster that sparked George Allan’s interest in brass band music. William Dodds also had connections to the choir at St John’s Church in Old Shildon prior to the building of All Saints’ in New Shildon. The Durham Chronicle of Friday 10th August 1855 tells us of a ‘pleasure trip’ to Redcar for the church choir, which had been laid on by the Rev James Manisty, M.A. and says “Although the weather was rather unfavourable the party enjoyed themselves, and returned home highly pleased with their treat. The singing of the services in this church has been of late greatly improved by the superintendence of Mr Wm. Dodds, late of Darlington, who has exerted himself in bringing the choir to its present state of excellence.” He was also the conductor of the Old Shildon Choral Society, so actively engaged in singing activities within the community. It’s easy to understand how the in an overcrowded new town with questionable sanitation the prospect of the arrival of a new fresh water supply could cause such celebration, and also easy to imagine that days like this would stay in the memories of the young children that might witness it. The Allans, during the 1870s, lived on Adelaide Street, not far at all from the home of bandmasters Francis Dinsdale and his son Edward. The Dinsdales, wanting to ensure an ongoing supply of talented brass players for their Saxhorn Band, maintained a Juvenile Band for young bandsmen in training. At this time the brass band movement would have been the preserve of the men, and boys, of the town. Though girls would be taught to sing, and play the piano, they would not be allowed to join the men in the brass band. From the documented evidence we can see that during Thomas and George’s childhood, the Juvenile Band was operated under the custodianship of Edward. We don’t know exactly when the Juvenile Band was started but it is probable that it was either at the same time as, or just after, the Saxhorn Band. Nor do we know exactly when Thomas Edward Bulch and George Allan were recruited into its ranks, though from their respective ages we can speculate that it would have been within a similar period of time and that the two almost certainly played together in this band. Thomas would become the Juvenile Band’s solo cornet player, and George Allan, though he would later graduate to cornet, became its solo tenor horn player. We know from newspaper reports that the New Shildon Juvenile Band were not always confined to rehearsing in the band room. On parade days and other local civic and societal occasions such as the Heighington Flower Show, at which the Shildon Saxhorn Band made a regular appearance through the 1870s, it’s likely that members of the Juvenile Band would have been able to attend. On occasion, the Juvenile Band would be able to be seen in its own right separately to the senior band. Gradually, and subject to their abilities, members of the Juvenile Band would have been migrated to a position in the senior band. While Thomas Bulch and George Allan were growing up, and then, finding their feet under Edward Dinsdale in the New Shildon Juvenile Band, the town’s Saxhorn Band continued to go from strength to strength within the confines of the town itself and beyond. Newspaper reports tell of just a few of the engagements they attended, giving a flavour of the role of a brass band in mid-Victorian working class England. It is possible that Thomas Bulch at least would have attended, if not performed at, many of the later performances in this period, and that some of what he saw would have influenced his own perception and vision of what made a first-rate brass band, and what role it should play in the community. In 1862, the year of Thomas Bulch’s birth, the Durham Chronicle of 13 June 1862 tells of an appearance of the Shildon Saxhorn Band wherein the band had, the previous Saturday, headed a procession of the Ancient Order of Foresters, Willington, from the Commercial Inn, Willington to Willington Hall. The Saxhorn band “ably performed their duties, and gave great satisfaction to the officers and members of the court, and musicians.” At Willington Hall, following a sermon, the band played “God Save The Queen” and then the procession moved on to Burn Hall and back to their court room for dinner at which members of the band sang for those in attendance. As the Durham County Advertiser of 23 June 1865 reports, “Under the auspices of the New Shildon Saxhorn Band a picnic was held at Newton Cap Park on Tuesday evening, when about 200 young people attended and enjoyed the merry dance to the lively strains of the band. Numbers, however, seemed to prefer to race for a kiss, in the numerous games which were indulged in in various parts of the ground.” Then both the Newcastle Journal of 7 Sep 1895 and the Newcastle Guardian and Mercury of 9 Sept 1895 tell us that at a band contest in Crook as part of the Crook Agricultural Society Annual Exhibition the Shildon Saxhorn Band came second to the Fourth Durham Rifles Band. Other competing bands were Crook Saxhorn and Witton-le-Wear bands. Later that same month, according to the Durham County Advertiser, the Shildon Saxhorn Band were engaged to lead a procession, with the banner, of the St Johns Order of Oddfellows from their lodge room at the Talbot Inn, West Auckland to the church for a sermon. The revelries and processions continued into 1866 where the Newcastle Daily Chronicle of 9 July 1866 tells how at the Shildon Lodge Colliery Reading Room Gala, held in connection with Messrs. Bolckow and Vaughan and Co’s Colliery and excellent tea was provided for upwards of 500 people presided over by ladies interested in the welfare of the institute. The Shildon Saxhorn Band was in attendance and dancing was kept up till dark. In the late 1860s and early 1870s, Thomas Bulch senior seems to have been a volunteer in the 4th Durham Volunteer Rifle Corps, being elevated to the rank of Sergeant and taking part in a number of rifle shooting contests in the Bishop Auckland area. Accuracy was a key characteristic of a volunteer part-time soldier, and these contests encouraged the men to practice. The volunteers would meet at the Newton Cap Rifle Range just to the west of Bishop Auckland. In 1871 Thomas won the Helmington Challenge Cup, given by Mrs Spencer of Helmington Hall and awarded for making the highest score three times in succession. This came with a cash prize of £1 and 15 shillings. Two engagements are described for 1872. In August the Durham County Advertiser tells us that the Shildon Saxhorn Prize band was engaged to perform at the Tudhoe Floral and Agricultural Society annual show (one of the oldest shows in the county, it states) to attend in uniform and perform a choice selection of music. This is the first indication we see in any local newspaper reports that this band appeared in uniform at times. Pictures of the band of New Shildon, of which there are few, usually show them in working clothes and cloth caps. Then, on 13 September, the Durham County Advertiser tells how the Shildon Saxhorn band was engaged for the Sedgefield Flower and Pigeon Show and “enlivened the scene by playing lively selections of music during the show”. The Northern Echo of Monday 28th July 1873 tells us that at a picnic held the previous Saturday afternoon the miners of New Shildon gathered on a field owned by the owners of their employers. Prior to that, they had marched through the streets with two “splendid” banners in a procession headed by the New Shildon Saxhorn Band. Later all kind of amusements were partaken of including foot-racing, wrestling, kiss in the ring, dancing, Aunt Sally, turzey etc. Later that year at a band contest at the Tow Law Flower Show the Shildon Saxhorn Band came 3rd, conducted by Francis Dinsdale. In June 1876 the Echo this time describes the “Grand Attraction” of a Whit Monday, Order of Druids Annual Brass Band Contest and Gala at Woodlands at which the New Shildon Saxhorn Band have entered to compete, then in August reports of the band having entertained at the Heighington Flower Show. A report from 1877 in the South Durham & Cleveland Mercury contains the first suggestion that a young Tom Bulch may well have been part of a concert involving his grandfather’s band by reporting, “Co-operative Hall, Old Shildon. – A concert of vocal and instrumental music was given in the above hall on Monday night, under the auspices of the Shildon Saxhorn Band (conductor Mr F Dinsdale), which played popular selections of music, assisted by the following artistes:- Miss Sallie Dargue, Miss Costello, Miss and Master Bulches, Mr. Sant and Mr. H Hopper.” This could have been a reference to one of Thomas’s older brothers, but we know Thomas was a noted singer and at age 16 he could well have been the Master Bulch referred to. In August of that year, the band reportedly returned to entertain again at the Heighington Flower Show explaining that once again Mr F Dinsdale had led the band. During this period, though, Thomas Bulch continued to be engaged in musical activities aside from the brass band and was just as comfortable as part of a concert orchestra. In October of 1879, when he would have been a young man of almost eighteen years old, Thomas was one of the entertainers at a concert at the Town Hall in Richmond, North Yorkshire for the benefit of a Mr. John Race, who had taught music and singing to the poorer classes gratuitously for over twenty years. The concert was held under the patronage of the Earl and Countess of Zetland, the Borough Member, the Mayor, magistracy, and gentry of the locality. Thomas is listed as one of the vocalists for the evening, as was his sister Mary Jane, who in July of the previous year had married a William Summerbell of Richmond. Perhaps Mary Jane’s having married into a Richmond family explains the pair’s involvement at that particular engagement in that town. William Summerbell was a wine porter at the spirit vault in Barnard Castle and he and his wife, Thomas’s sister, lived with William’s mother, a china dealer in the town. As well as singing, Thomas also played second cornet in the orchestra that evening. All the while, through this colourful swirling carousel of fetes, parades, celebrations, contests, horticultural and agricultural shows, dances and galas, the New Shildon Saxhorn Band had been the darlings of the town with their repertoire of popular tunes. The brass band movement had so ingrained itself into the fabric of the working class society that to hold such an event without a band in attendance to brighten the day would be almost unthinkable. Being part of a band was a way of ensuring that one would be able to, and often be assisted to, attend some of the most enjoyable social events on the calendar. Yet all was not quite well with the bandsmen of Shildon and by the end of the 1870s, something was to happen that would introduce competition and rivalry to New Shildon and trigger a separation of journeys for Tom Bulch and George Allan. Public houses played a key part in the lives of the working class across the nation as social hubs, particularly for the men. The men of New Shildon were no exception. For so small a town it boasted a good many public houses, and they acted as meeting places and key social hubs. As trade union activism increased opportunity for the workers to attend the pubs, the increased opportunity for drinking alcohol led to perceived issues in social conduct and health. The Temperance movements arose in reaction to those aforementioned social factors and sought changes to combat the negative effects of alcohol on society. The earliest Temperance Movement is thought to have formed in Belfast, inspired by Presbyterian minister John Edgar and later John Livesey. Temperance initially targeted the drinking, specifically, of spirits; but over time through its various factions included ale, and veered between a policy of demanding a legal ban and principles of moral persuasion. It is perhaps easy to see where the clergy and members of ‘polite society’ might be drawn to abstinence; however as to why ordinary working men felt drawn to the temperance, there is a terrific piece of reporting in the Durham Chronicle from nearby Old Shildon of 25 June 1859 where the writer captured the essence of the speaker’s reasons for taking the pledge, and for how long they have adhered to the principles therein. “TEMPERANCE DEMONSTRATION AT SHILDON. ln the long room of the temperance hotel at Old Shildon (formerly known as the Black Lion Hotel), a large meeting was held on Saturday evening, the 17th inst. Through the kindness of Joseph Pease, Esq., the above room has been set apart for the use of the temperance society of Shildon, and it must be highly gratifying to that gentleman to know that working men of Shildon duly appreciate the boon. A mental Improvement society has been formed, in which reading, writing, arithmetic, reciting, singing, and discussion is carried forward; the room is supplied with temperance literature, and library is about to be established. When working men learn to depend on themselves, and to cultivate those talents with which their Creator has endowed them, we may anticipate the speedy arrival of “the good time” about which so much has been said and sung. Robt. Jacques, a turner, from Shildon Works, had been a teetotaller three years, and felt bound to give it a good word. Ever since he left off drinking, he had been better mind, body, and pocket. Public-houses were Injurious to the working man’s Interests, and he believed the working-classes would never have their rights until they became sober. Thomas Dixon did not feel as If had much to say, but thought he would come forward to show which side belonged to. He had tried teetotalism, and having derived much benefit from it, he thought he should be very foolish give it up. John Tinkler, a smith, had been a member the temperance society two years. He could not say that drinking had done him much harm, but he believed teetotalism to be infinitely better. If a man could work down the pit without drink he could do without it, too. Drink only excited a man, and took away the little bit of sense he had. It was a dangerous thing to begin with a single glass — he was sure there was nothing good to be learned in a public-house. Example was more powerful than precept; it was, therefore, the duty of every man to his best to banish drink. Robert Millett had abstained nine years. He had not been in the habit of addressing public meetings, but was willing to do the best he could. Many died young in consequence of drinking, and though but a young man, eternity alone could tell what evils teetotalism had saved him from. Many of his youthful companions had derided him because he would not go with them to the public-house; but he was proof against scoffs and sneers. His head, heart, and hands should all be employed to put down the drinking system—that system which made widows, orphans, criminals, and paupers. Robt. Martin, fitter, was sorry could not say that be had been nine years a teetotaller. He had been in Russia, and had travelled for a fortnight together in the cold. He had tried both spirits and tea, and always derived more warmth from the latter than from the former. He had seen men frozen to death while under the influence of spirits; he often wondered he had not been nipped to death. He had lost his senses and his money too, going into the public-houses. If he had been a teetotaller aa long as some Shildon, he should, like them, have had two or three houses of his own. He was happy to say that he had the whole of his wages in his pocket; and he felt more comfortable under the new dispensation than under the old. Isaac Haigh, fitter, believed drink unnecessary as beverage, and would leave the doctors to deal with the physic. He formerly worked In Upleatham mines, and before becoming a teetotaller he never weighed more than nine and a half stones. He had lost a leg: and after trying teetotalism one year and a half, he could bump down ten stones without his leg. They talked about landlords bagging-out, but was the use of bagging out with bad stuff. He didn’t bag-out, and yet weighed heavier than before. Getting drink to help them to work, was something akin to the waggoner who took drink drive the horses, and gave the horses water to help them pull the load. Jno. James – joiner, and a teetotaller of long standing, was pleased find his brethren going forward in everything good. In reading Adam Clarke he met with a sentence which said, “A knowledge of Ignorance the beginning of knowledge.” There were many things going on the world of which he had no knowledge, and he determined to get to know, and for that purpose he had joined the “dry company.” He felt disposed to remain a teetotaller. It had done him good – he had money in his pocket. It always afforded him pleasure to attend a temperance meeting. It was not much that he could say, but he was willing to say all he could. Later that year, the building where the Old Shildon Temperance Society met, which had once been the Black Lion on Chapel Row, now re-designated as a temperance hotel, was to become known as the Temperance Lecture and Reading Room. Down the hill, in New Shildon, the Temperance Society there continued to meet for some time in the British School where George Allan and Thomas Bulch would receive their education. The Temperance Movement as a whole attracted support from a variety of religious organisations, especially non-conformist Methodists, Quakers and Salvation Army, who collectively and separately lobbied parliament to restrict alcohol sales. A church of England Temperance Society was founded in 1862 and reconstituted in 1873 and the Catholic League of the Cross, proclaiming total abstinence from alcohol, founded in 1873. We know from the Brusselton Folly newspaper report from 1865 mentioned in the previous chapter that the Shildon bandsmen, as with many working-class men of the day, enjoyed the opportunity to imbibe in an alcoholic drink or two, and that there were times when the indulgence was perceived to have been taken a little too far from both the perspectives of their bandmaster, and of the public. As more of the men of the town of New Shildon signed up to the temperance pledge, there may well have been a perception by those bandsmen that no longer partook of alcohol that a band consisting solely of like-minded players might be better in terms of performance of music. Perhaps the mood and attitude of the band overall shifted as time went on; for in August of 1870, and again in 1871, the New Shildon Saxhorn Band under Francis Dinsdale had provided entertainments at a Grand Temperance Gala at Brinkburn and Pierremont in Darlington which was reportedly attended by several thousand persons. It would not necessarily mean that the members of the band would have had to be adherents of “the pledge” to perform at this event, though it would be unlikely that ales or spirits would be found there, either. Other brass bands around the North were either establishing themselves as, or declaring themselves to be, aligned to the Temperance Movement; however, this report suggests that as of 1871 the town of Darlington did not yet have a temperance band of its own, or near neighbours, to call upon. The articles do imply, however, that the Dinsdale family by now had begun to have a connection to the Temperance movement. This mention of Milburn’s Model Band of Middlesbrough may well be significant in the story of Thomas Edward Bulch, for reasons that we will come to later. It appears, though, as if New Shildon’s Juvenile Band may have been the first to rebrand itself by appending ‘Temperance’ to their name. As Edward Dinsdale was its bandmaster and conductor, and we know that he became the first bandmaster of the New Shildon Temperance Band, this seems a distinct possibility. On why, there is insufficient information available to explain, though perhaps Edward may have taken the temperance pledge himself at some point and perhaps was keen to promote the values of the movement to the young bandsmen in his charge. Perhaps there was some incentive to do so, or some opportunity to be derived from it. The earliest found mention of a New Shildon Temperance Band, without the suggestion of being juvenile, is a record of a contest appearance by them on 24th June 1879 where they were placed 2nd at the Lofthouse-in-Cleveland Contest, earning a prize of £4. This suggests that the band would have formed long enough before that date to have acquired a full complement of players, equipped, and rehearsed well enough to have been placed at contest. So, perhaps Edward Dinsdale felt hat members of his, once juvenile, band had developed and aged to the point of qualifying to be a senior band. Or perhaps between the members of both Temperance Juvenile and adult Saxhorn Band, there were sufficient members having taken the temperance pledge and in frustration with their drinking counterparts forced an agreement to break into two camps. Whatever the reason, New Shildon’s bandsmen did break away into two groups. The Bulch family along with Edward Dinsdale aligned themselves to the side of moral virtue. Presuming why George Allan opted to stay with the Saxhorn Band would be speculative, but there is one story from his life that we shall come to later which implies that he wasn’t averse to, nor saw any issue with, enjoying an alcoholic refreshment. In any case, this change would create important opportunities for both Tom Bulch and George Allan respectively. Another significant report of an August 1879 engagement, according to the York Herald, was that the Temperance Band also appeared at Shildon Show, led by Thomas’s Uncle Edward Dinsdale. A passing detail of interest again on this occasion is that they came third in the band contest, with the second-placed band being Leeds Model Band. In July 1880 the Temperance Band played at a Primitive Methodist gala at Darlington, one Saturday, at the head of a procession from North Road Institute to Southend Grounds. The band then, on 20th August, played (according to the Darlington & Stockton Times of the following day) at a contest at the Barnard Castle Flower Show; where they came third after Milburn’s Model Band. Despite this shift of sentiment towards the clean-living men and boys of the Temperance Band, it is clear that both the New Shildon bands remained under the influence of the Dinsdale Family as newspaper reports continue to name Francis Dinsdale as bandmaster of the Saxhorn Band and son Edward Dinsdale, possibly having needed to become bandmaster of a senior band himself, in charge of the Temperance Band. Of Bulch and Allan, it was Thomas Bulch that was the first to reach the age when they were expected to work to earn their living. Whilst still living with their large families in their modest terraced homes the need for sons of the household to provide an income was inevitable. Unlike his older brother Francis, who had become a coal miner, Thomas Bulch accepted an apprenticeship at the blacksmith’s shop of railway wagon works and was followed by his younger brother Jeremiah. We don’t have an exact date for Tom Bulch’s acceptance into the Shildon works, but it was certainly before the taking of the 1881 census. To have been taken into employment at the railway wagon works, with its two sites in the town by then acquired by the North Eastern Railway, must have seemed almost an inevitability for the young musician. Labour was very much in demand, the newer of the two works sites was just at the end of the street, and Thomas’s father was a timekeeper there. Whether he had a mechanical, or engineering, mind is uncertain. We do know, though, from records retained from that period held at the National Archives, that in 1876, when Thomas would have been around 15 years old, he, and older brother Frank, joined the Mechanics’ Institute on Station Street in New Shildon. Frank joined in April, paying the subscription fee for the quarter of 9 pence. Thomas joined in May. Both renewed their membership for the quarter in July of that year, but afterwards, let their membership lapse. Neither re-joined. Their grandfather Francis Dinsdale, recorded in the same members’ book as ‘Frank’, had been a member from 1871 to 1872, but again allowed his membership to lapse. This could well have been as part of a quest for basic engineering knowledge as the Institute served an educational purpose, but may just as equally have been with a view to accessing some of the other facilities on offer. We’ll return to look at the Mechanic’s Institute later in this story. The year 1871, when George Allan was but seven years old, saw a number of changes politically, and consequently, culturally, that would lead to the foundation of an event that would prove to be a key influence upon him. This would become an annual occasion of tremendous importance to the working communities of County Durham, and one of the key dates on the calendar of every brass bandsman in the region to this day. 1871 was the year that saw the passing of the Trade Union Act, giving legal status to the unions representing bodies of workers, though the, then Liberal, government tempered this with a Criminal Law Amendment Act that made picketing punishable by imprisonment. The coal mining communities of the North East of England had long been discontent with their treatment, not least of which the binding ties between the worker and the colliery that employed them, that prevented miners from moving to where favourable pay and conditions might be offered. Non-compliance with a coal owner’s terms of employment would sometimes result in intervention from units of the military. From the mid 19th Century activists had travelled the villages building support for a county-wide union. Earlier attempts at a union had been made but were crushed shortly afterwards. In 1871 there was now a belief that a Union could survive. Word was communicated out to the mining communities of County Durham to convene in the city on the 12th August. From the early morning, miners and their families, on foot or in carts, followed the narrow roads from their villages toward Durham. The folk of Durham itself were alarmed, for the miners were of a different ilk, and there was fear of a riot. The gathering on the field at Wharton Park began as something akin to a country fair, and as was becoming the tradition with such gatherings, arrangements had been made for sporting and athletic competition, and of course a band competition. In the afternoon proceedings turned to speeches, with appeals to miners to agitate for the passing on a Mines Inspection Bill through parliament, and condemnation for the Criminal Law Amendment of that year. The formation of the Durham Miners Association, in part through the demonstration of strength through that first Gala yielded results. The following year, the Durham Coal Owners Association met the Miners Association and agreed to end the bonding of miners to collieries and pits. For George Allan, however, the main thing was that what had been something of a sideshow at the 1871 Gala developed by the time of the following Gala in 1872 into being a prominent and key feature of Gala day. When the miners of each pit or colliery in County Durham arrived in Durham City on 15th June 1872, they marched through it in a column headed by a brightly coloured banner, featuring heroes and slogans of the union movement, and a brass band. The city would have been alive with colour and music in a spectacle the like of which may never have been experienced before. Just as now the bands and procession would pass by the balcony of the County Hotel on their way to the racecourse where the meeting was held. The Northern Echo at the time reported that 70 brass bands had taken part in that 1872 Gala. Gala day would become a rare opportunity to take in so much such brass music in one sitting, and even today the sound of it evokes a real sense of the hope, solidarity and aspiration of the Durham Miners that it can cause an emotional reaction. Perhaps this is why George Allan claimed it to be an inspiration on his compositions. Whatever the reason, we understand from previous research conducted by local historian and former bandsman Bob Wray through his exchange of letters with Jack Kitchen, the former Shildon bandsman, that George would sit at the entrance to the field and hear all the bands march on, and that this would inspire him to write another march for the following year’s Gala. We don’t know when he attended the Miner’s Gala for the first time, but there are hints within the titles of his compositions that allude to this. For example, he composed a march entitled ‘With the Banner’. Something else both George Allan and Thomas Edward Bulch had in common from an early age was the ability, and desire, to compose and arrange music. While for the greater majority of bandsmen the skill to be able to interpret their own part in an arrangement and play it competently under the direction of the conductor was sufficient a challenge to satisfy their ambitions, George and Thomas were among a far smaller group that held this altogether grander ambition to create. The two boys must have realised, or been advised of, the importance of capturing their compositions so that they could be shared. Both would, in time, see their compositions, including those two named early pieces printed and published. Thomas, according to his grandson Eric, composed his first contest march “The Typhoon” at age of seventeen years old. It would be hard to tell when ether’s composing activity truly started as early compositions would probably have been handwritten and have not survived. But we do know something of “The Typhoon” and can date it approximately. What’s important about “The Typhoon” is that it was not just Thomas Edward Bulch’s first known composition, but it was also his first published composition. As we mentioned earlier in this narrative, one of the ways that brass bands could acquire music throughout the peak of the brass band movement in the nineteenth century was through published brass band journals. We have acknowledged already that New Shildon’s former bandmaster, Robert de Lacy, even managed to publish his own journal when he established a life in London. There were publishers of journals in various parts of the country. One such publisher was T. A. Haigh of Hull. Thomas Albert Haigh, born in 1843 was, according to brass band academic Roy Newsome, a Lancastrian, who had moved to Hull. He was a high ranking freemason and also an examiner for the Tonic Sol-Fa College, being a reputedly good singer in his own right. It’s remotely possible that Bulch and Allan may have become acquainted with him through their singing studies as much as their brass band involvements, or even that they submitted their compositions for consideration; in whatever way they had found a connection to Thomas Haigh, he was the first publisher to publish compositions by both men. His journal regularly included pieces by a good selection of the principal brass composers of the era including William Rimmer, J. Ord Hume and Edwin Swift. These names are still familiar to bandsmen of all ages today. Haigh started his ‘Amateur Brass and Military Band Journal’ somewhere between 1877 and 1879. Of the two young New Shildon composers, it was Thomas Edward Bulch that Haigh published first when he published “The Typhoon’ as piece number 263 in that journal. Tracing the numbering back from later pieces we can date approximately then hypothetically the piece would most likely have been published just over halfway between the journal’s formation and 1884, so possibly 1880 or 1881. Thomas went on to have a number of pieces published in the Amateur Brass and Military Band Journal, of which we will hear more soon. Did George Allan get the idea to later submit pieces to Haigh because Tom Bulch had done so? Did Tom Bulch suggest Allan to Haigh or Haigh to Allan? George Allan, not yet a published composer, continued under the tutelage of Francis Dinsdale in the new Shildon Saxhorn Band, moving to the solo cornet player’s role. He explained in 1896 how his early musical influences had included the romantic church music of Sir John Stainer, with whom, coincidentally, former Shildon bandmaster Robert de Lacy was at that time working as a Vicar Choral at St Paul’s Cathedral, and the work of the Italian born British pianist and composer Muzio Clementi. His compositions may possibly also have been shaped by the musical selections and taste of his bandmaster, and the other composers emerging specifically to create secular music for the growing brass band scene. As these two composers were finding their way around music in an era before the availability of recorded music or radio, their understanding would be limited to that music which they either heard or saw directly. Copyright © 2019	Friends of the Wizard and Typhoon. All rights reserved.